We hope that you will continue to read our blog and visit the gallery in 2016. For our first exhibition of the year, we have chosen works with auspicious motifs suitable to the New Year season, particularly cranes, pine, and plum. 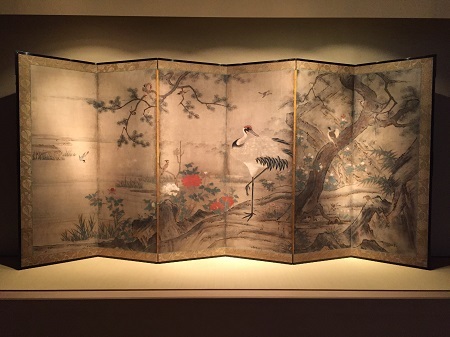 Works with festive atmospheres are on display, including a Kano school flower-and-bird screen from the Muromachi period, a pair of hanging scrolls depicting cranes with pine and plum in the background by Itō Jakuchū (1716 - 1800), and a scene from the Tale of Genji by Iwasa Matabei (1578 - 1650). Though the weather continues to be cold day after day, we hope you make the time to stop by and see the show.